Black and White and Loved All Over: 5 Years. Five years ago today Nekos and I got hitched in a little stone chapel in Nashville. The wedding was beautiful but very stressful and expensive and over before I knew it. The marriage, however, has been an answered prayer. And that's good because that's the only part I ever cared about. I was never the girl who dreamed of the big wedding but, rather, the big, fat, life-changing relationship. Earlier this week I pulled an old journal down from a bookshelf. It was from the year I was 17 and a junior in high school, and in it I found one entry that I'd scribbled down about a boy who I'd really liked but who I'd apparently scared off with my affection and earnestness. At the very end, I'd written, "I know that one day I'll read back over this and I'll be 30 and I'll think, 'Sweetie, don't worry. You'll find him.' And I'll be married and he'll sleep beside me and I'll watch the rise and fall of his chest, and brush my fingers through his hair, over his face, and I'll feel safe. Safe to love and be loved." Cheesy, I know. But important. Because even then I knew what I wanted, which was a stable, loving partnership with a man who I'm in awe of. I had a couple of the details off—like Nekos doesn't have hair that I could plausibly run my fingers through and I'm not 30 just yet—but in him I've found the safe place that I really needed, where I'm allowed to love the crap out of him and he's allowed to love the crap out of me, and we know that neither of us is going anywhere. It's the place, I think, where I've gotten to become the woman, and the wife, that I wanted to be when I was 17. And—because I know that love is so powerful and strange and out of my control—I am so thankful for him. Love the image and love you!! happy anniversary :) hope you're having a wonderful time in barcelona! love this post! 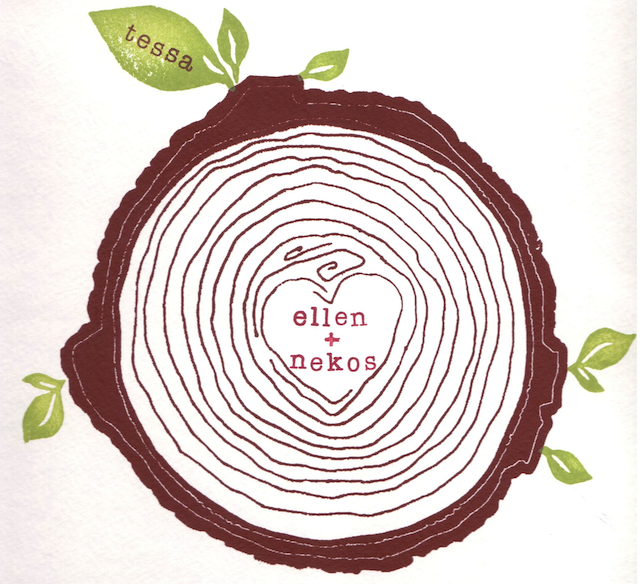 happy anniversary, ellen & nekos. That was wonderfully put and obviously so filled with love :) Happy Anny, guys! Hope you're having a blast! That is so amazing that at 17 you knew what you wanted AND made it come true. Congrats!